Only 17 percent of U.S. households use security technology, and Angee CEO Tomas Turek believes this leaves a large untapped market for a security system of Angee’s capabilities. While most home security systems see and store everything, Angee’s more discriminating. It operates in three security modes based on who’s home and the time of day. Additionally, when homeowners return, Angee turns to face the wall. Angee comes equipped with 360° rotation and motion-tracking technology, which Turek said was the most challenging engineering feat. Fulfilling pre-orders now, Angee security retails for $349 and includes one Angee, a security tag and access to the Angee Cloud. Using light and sound technology, BrainTap is paving the way for immersive meditation and brainwave training to become more accessible for users. You can either go all out and use BrainTap with a headset for an immersive experience or have a heightened meditating session through their Android or iOS app. The BrainTap headset features auriculotherapy — the delivery of light in the ears that activates the meridians known to directly affect the body’s organs and systems. The headset is used with the BrainTap Pro app which includes 800+ neuro-encoded audio files to help you meditate and optimize your brain capacity. The headset is available for $547 while the BrainTap Pro app can be bought from the store through memberships for different purposes like weight loss, stress relief and sleep, starting from $9.99 monthly, and an all-access pass for $29.99 monthly. Canadian-based designer and manufacturer Electra Meccanica displayed for the first time in the U.S. a single-passenger electric vehicle at ShowStoppers. The U.S. Department of Transportation reports that 80 percent of Americans commute to work alone in their personal vehicle, and that’s why SOLO works for the American market, says Jerry Kroll, CEO of Electra Meccanica. The SOLO features a lightweight carbon composite chassis to allow for a top speed of 80 mph. With a 100-mile range, the SOLO’s lithium-ion battery system requires only three hours of charging time on a 220-volt charging station or outlet. “We are producing the electric vehicle for practical commuters and the environmentally conscious,” said Kroll. Sold for $15,000, the SOLO is probably the cheaper luxury EMV on the U.S. market. It may sound like an odd concept, but soon consumers everywhere could be cuddling up with their own robotic companion. It looks less like a robot and more like a pillow, but the revolutionary technology inside includes a carbon dioxide sensor to identify breathing, an accelerometer to detect movement and an intelligent algorithm to soothe users to sleep. 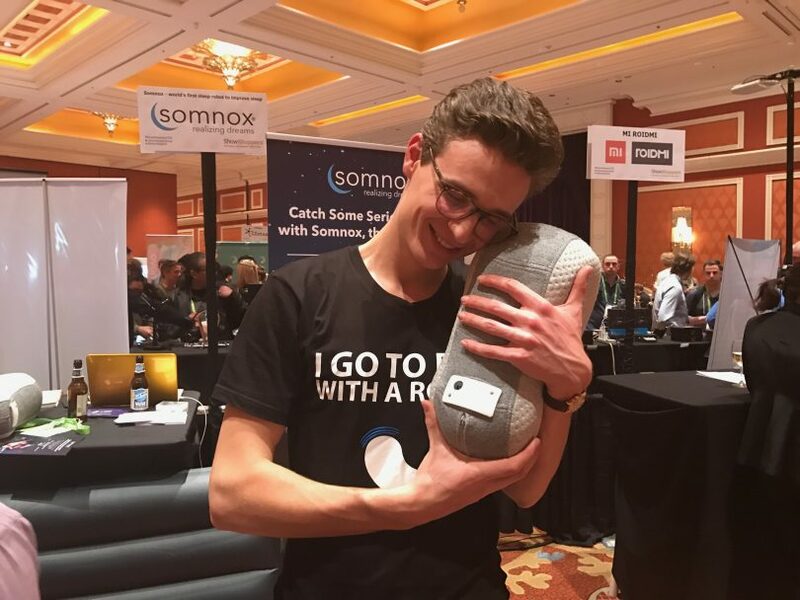 The peanut-shaped Somnox also comes equipped with a microphone to play audio, and soothing sounds like heartbeats and lullabies are included in its app. The hope is that users will feel the robot expand in and out as if it’s breathing, eventually leading he or she to start breathing along with it. Though it’s a big leap from sleeping with a loved one, studies show that more than one third of Americans don’t get enough sleep. 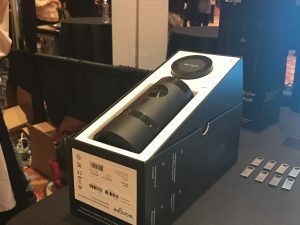 Due out this fall for $550, Somnox believes the high price will be offset by the fact that users will finally be getting enough sleep. The CDC has even declared sleep deprivation as a ‘public health problem’. The economic costs for the US is $411 billion per year, according to a study published by Marco Hafner and others in 2016. 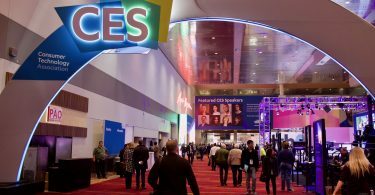 Shleep, launched at CES 2018 and created by sleep expert Dr. Els van der Helm and a team of fellow PhDs, offers solutions of personal support through a personalized sleep assistant that scans and learns your sleeping habits and suggests plans and sessions on how to improve your sleep through that data. Interestingly, Shleep is taking a step forward in app-based solutions by giving personal feedback and solutions to their customers. Users have to fill out a questionnaire after which they receive a tailor-made program that aims to help improve their individual sleeping habits, including relaxation and dealing with and detaching from technology. The information is presented in a series of videos along with with targeted exercises. “We are focussed on behavioral coaching that goes beyond just tracking someone’s sleep patterns and have tested these programs in workshops already,” said Tom van Wersch, marketing lead for Shleep. 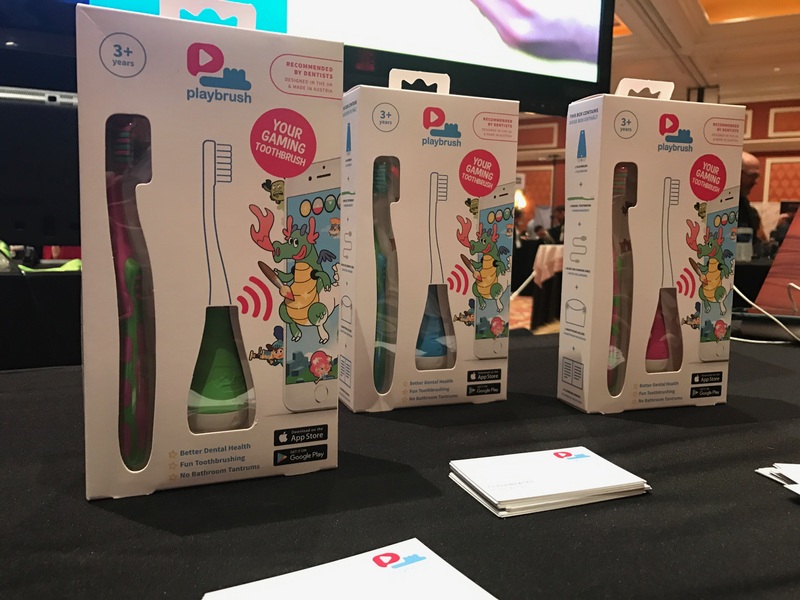 Playbrush is a smart toothbrush attachment that transforms manual toothbrushes into gaming controllers to make brushing your teeth fun. The device is easy to use. You attach the dongle onto the end of any toothbrush, connect to a smartphone or tablet via Bluetooth Low Energy and have access to five different brushing games. The advanced technology uses an accelerometer and motion sensors in the bottom of the dongle to measure brushing speed and location. The device’s algorithm translates brushing data directly to the app. This allows the game to adjust to the child’s brushing habits. For example, if a child hasn’t been brushing in a certain area enough, the game will adjust to favor that area. After each game, the app gives children a score and shows which areas they need to work on through a graph. It’s an innovative technology, but the games, which include an elf-themed blaster and painting simulator, seem more like fun novelties than anything with lasting replay value. 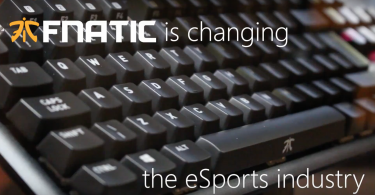 But if you’re looking for a reasonable solution to brushing problems, this could be the answer. It’s cheaper than competitors, and the company hopes to bring Playbrush to the U.S. market this year for under $40.